Entrance to Health is an online health shop that has products for weight management, heart and immune system health and personal care. When I consider trying a product that is promoted for its health benefits it is most important to me that the ingredients be as natural as possible. I recently had the opportunity to sample Azul which is touted as an organic and immune boosting energy drink. This “all in one” vitamin, energy and immune drink is packed full of nutritious ingredients including the “super fruits” such as acai berry, pomegranate and mangosteen plus beets, spinach, alfalfa sprouts and many more. In fact Azul has dozens of superfoods in this one drink. 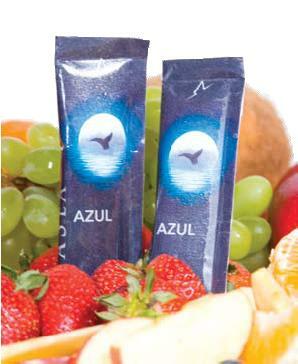 Azul comes in convenient packets that you can take along with you to work, the gym etc. The first time that I mixed it with cool water I noticed that it was a bit clumpy so the next time I used warm water instead and then added ice cubes once it was mixed. This worked really well and the drink was delicious and refreshing. It tastes like a tasty berry drink and is lightly sweetened with Agave. It has a wonderful “clean” taste and is also low in calories and fat. To learn more about Azul or the entire line of Entrance to Health products you are invited to visit the website. You can even sign up for their free newsletter to keep informed and receive special discounts and benefits.